Last time I ran a sale on the course (Memorial Day) it was massively successful. Wow, what a weekend! Unbelievable! What them marketing people say works, aye?! I took a few days off if you want to know. Those emails got me thinking. I realize that $379.00 all at once or $79.95 a month for five installments is a lot of money. Believe me, I understand that! Then, I also know what this course is. How extensive and yet practical it is. We even have people going through the course a second or third time! I could tell you all about the research and testing that went into the material, from refining it with students over years of teaching – one-on-one and in groups. Then there is the learning psychology material I continue to study and add into the course experience, including best practice habits and help with accountability in the online learning format. And the totally awesome suggestions we are getting from our participants which we are incorporating (or work to incorporate) constantly. The testing and tweaking has lead to many revisions, additions and changes since the course went online over a year ago. (To say we are obsessed would be an understatement). We even have students who contribute material – such as Alan’s practice log resource. And we hear from students who create their own material and send it to us – wow – such great learning to do that! (We will also add places where we can incorporate these contributions). Then we hear how much traction and motivation the new Ask Ari Live sessions provide, which also include my very own teacher, bassist and composer Wolf Wein, whenever we can get him. On the new platform, we have added coaching components, theory quizzes, interactive segments, motivational videos and the live Q and As. We are near obsessed with people being successful with this course. Over 20 hours of new video materials, all broken down into small bite-sized portions. Over 130 awesome and unique background tracks to practice with, custom composed by Wolf. Our Course Participants Talk to us a lot. Not because they enjoy sales, but because of the results they are getting! We have enthused hobbyists who are thrilled to see consistent growth, leaving plateaus behind, excelling and improving. They don’t play in bands and some don’t aspire to, but they love the challenge and are intrigued with meeting the bass musician who emerges as they follow through the units. We have church band players, weekend warriors, regular giggers, wedding band bassists, bassists playing original material in their own bands… I know because they email me telling me about that rehearsal when their bandmate commented on a cool fill (thanks to the systematic “Groove and Fill exercises”) or the drummer notices their solid groove (thanks to the “finger kung fu”!) or they tell me about that moment when they learned a new tune and it was so easy because they understood the chord progression. Or they played their first solo and it was awesome. We have 20-somethings who are gung-ho and dedicated and practicing way more than the recommended 45 minutes 5 times a week and we have busy professionals in other fields who want to improve with the little spare time they have and follow the 45minutes 5 times a week prescription with great consistent success. And we have people in their 60’s and beyond who tell me that for the first time in their lives they feel hope, a sense of confidence growing, and are beginning to leave the old “could have, should have” behind in favor of actually enjoying making music. 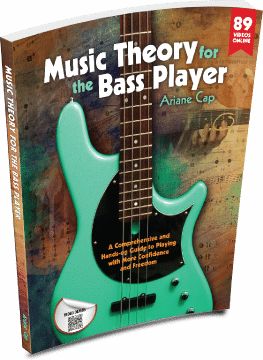 We have aspiring pros who have set their minds to becoming bassists and say they have never seen material presented in such a concise and results-oriented way. We have some busy bass pros and studio musicians who take the course to improve their technique or who have some holes in their theory knowledge they want to plug once and for all. I know the only way I can get similar results with students are one-on-one private lessons – and it is a way better deal to sign up for the course than to pay for individual lessons. Some students still prefer in-person or online lessons and I have quite a few who do lessons once a month or every other week in addition to the course. All this to demonstrate that I know that the value of this course is way higher than $249.00. This price is an amazing deal for what you are getting. So if your main interest is to save $25.00 or $50.00, if sales is what would push you over the edge to buy this course, I’d venture to say, you are maybe not the right candidate for it. Yes, saving money in sales is nice, but this course – you gotta want it because you only get the results when you put in the work! You are not alone, but you need to show up. I got an email a long time ago from a woman scolding me for the $379.00 price tag. She knew nothing about the course or what the benefits are. She did not want to try the free trial. She just didn’t like the number because she felt entitled to get it all for much less. She went on to tell me that she owned five very high-end basses. That is, of course, fine, but it showed me that her focus lies elsewhere – more value placed on the gear rather than the learning. She would not have made a good candidate for the course. If this is you, please do not buy this course. I want people to sign up because they really want to learn and improve and see the value in it. Just like you cannot buy great playing by just buying a great bass – you will be asked to do the work in the course. 5 times a week for 45 minutes is what gets you consistent results. A good question to ask yourself is: are you willing to invest in yourself? In your ability? If you think of it that way, the $379.00 all of a sudden becomes an investment in yourself. It becomes an incentive to make the best of it! As tempting as it would be to have a quick sale this weekend, throw it out there once more with a cute coupon and take a few days off as a result of it – I will not. I want all the participants to be there for the right reasons. I want people to succeed, not log in twice and never come back. I want people to feel great because their playing is soaring, not because they saved 50$! PS: If you absolutely need to have sales today – you will need the book for the course. Amazon currently has it on sale for 10% off. We have Amazon to thank for that! Totally agree! Although I was one of the early adopters that benefited from the biggest deal. 😉 But I totally get that you can‘t jump on every deal bandwagon. You would rarely be selling at normal price if you did. I like the twist at the end „if you‘re really out for a deal, go get the book on Amazon for 23% off“. I thought that was funny. Anyways, looking forward to being grandfathered in. I started the course, but decided to go through your Pentatonic Playground on TrueFire first and come back to the course later. So, looking forward to the new platform for that. Sounds like a nice detour. Gimme Five and all. The pentatonic course sits nicely with the other material, I think. I have been using the course for 6 months and The course is worth far more than $249.00! I haven’t thought about the price once since I bought it. Seems like I have had hours of lessons with Ari. I have asked questions directly and she has responded personally within 24 hours. I bought her book and will buy her next course the day it’s released. For $249 its a gift.. This is ALL so very exciting and inspiring!!! Quizzes? Fantastic! Streamlined layout? Can’t wait! Obsessed? Tell me about it! all the work and effort you put in! The new platform will have interactivity! I agree with what you are saying, (yes I am one of the lucky ones with the Early Bird $129 buy in (so to speak), I would of paid the full $249 as that works that is still only $12.45 a week for 20 Weeks worth of excellent tuition (videos, PDFs, backing tracks etc which you can go back to all of the time and revisit). Well worth it when a 121 lesson can cost from $25 for a 1/2 hour session. Thank you for that, Barry! All my early birds – including the wall chart early birds (especially the British ones with postage gallore, my!) – have my big thanks and appreciation. Thank you very much, Pim. It is about results for my students, that is my main driver! Congrats on your progress! Some high-quality products rarely or never go on sale, but people happily buy them anyway. There’s a reason for that. Great to hear, Jeff! Thumbs up on your priorities :)You keep rockin, too! Thumbs up and great respect for your statement! That was even more motivating than your last post on why „just playing“ is not working, which finally made me sign up to your course a few days ago. I totally agree with you. Welcome to the Course, Joeni! Great to have you! Hope to see you at this Sunday’s Ask Ari Live – any questions – bring them on. When ever you feel the time is right to take action and start something that you always wanted to do, you shouldn’t wait for a discount that might safe you a little money at some time in the future. At least this was my way of thinking. Keep up the good work! Looking forward to the upcoming journey with your course. Wish you a great ride and bass adventure with Music THeory for the Bass Player, Joeni! Your course is worth every penny and then some. I feel very fortunate to not only get the early bird price but make payments as well. Cheers Ari and thank you!